Somewhere at the intersection of technology, analytics, and holistic digital advancements, David Shrier finds himself at the forefront of each industry. Known as a futurist, author, innovator, and an Associate Fellow at Saïd Business School, University of Oxford, David is defining how we implement technology in the financial and digital world. Shrier has focused his efforts on developing new businesses and leading innovation programmes. He has driven over $8.5 billion of growth initiatives for multiple Fortune 1000 companies such as Ernst and Young, The Walt Disney Company, and AOL Verizon. David also specialises in coaching entrepreneurs, developing product, and leading investment strategy in some of the most prominent private equities. In addition, David is the Co-convenor on both of Oxford Saïd’s Oxford Fintech Programme and Oxford Blockchain Strategy Programme. His experience in data, fintech, cybersecurity and digital identity makes him a leading expert in what is becoming essential knowledge for the working professional. The Oxford Blockchain Strategy Programme provides an essential foundation to blockchain. The programme defines what it is, how it works, its organisational implications, and how to practically integrate the strategies into your business. David aims to create an awareness of the digital future as blockchain has the ability to change every 21st century business model. 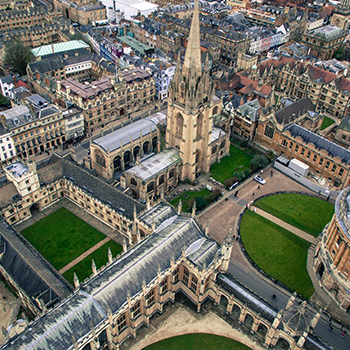 The Oxford Fintech Programme approaches fintech from a business perspective. The modules investigate the state of the market while teaching participants to imagine the future of finance. Shrier ensures, “This is not ‘flip on a video, sit back, and have someone give you TED talk’ learning; that’s entertainment, but actually delivers less long-term value to you. This is hands-on, world-class, University-backed, project-based learning. It’s harder. But it generates better outcomes. Effortful learning is higher-impact learning.” The Oxford Fintech programme will enable participants to contribute to the global dialogue of fintech and be equipped with practical tools for innovation. The programme prepares participants to navigate the rapid fintech evolution as it becomes increasingly relevant to contemporary business strategy. Outside of academia, David is the founder and CEO of Distilled Analytics, a data/machine learning fintech derived from MIT. The technology uses precision analytics to predict human behaviour and so improve financial decision-making. It is through the Online Oxford Programmes and other initiatives that David hopes to empower professionals and familiarise them with the evolving tech landscape. Technological disruption is changing the face of the market. Innovation we never thought was possible now has the ability to transform even the most basic organisations. The Online Oxford Programmes offer like-minded business leaders the opportunity to learn from industry experts and join the official Oxford Executive Education Alumni LinkedIn group – a closed networking group for all alumni of Open, Online (GetSmarter) and Executive Education Programmes from Oxford Saïd. A knowledge of blockchain and fintech can no longer be reserved for economic experts – it is time to join the future. Is your corporate strategy resilient enough for the digital revolution?